The following abbreviated insightful article is by Michael Snyder. He is a Republican candidate for Congress in Idaho’s First Congressional District. “Americans are increasingly embracing socialism, and this is particularly true for young adults under the age of 30. Of course, our society has already been very heavily socialised. We have been trained to believe that if a problem exists, then it is the job of government to fix it, and over time government on all levels of our system has just gotten bigger and bigger (and government debt in the trillions with it). But what most Americans don’t realize is that the United States never would have become an economic powerhouse without free-market capitalism, and the further we drift away from our roots, the deeper our economic problems will become. We need leaders who are willing to stand up and proudly declare that free market capitalism works incredibly well when the shackles are taken off, and that is precisely what I intend to do. These numbers help to explain why politicians such as Bernie Sanders and Elizabeth Warren have such high levels of support among Millennials. These young people were raised in schools that taught them that we have a “free-market system” in America today, even though that is not really true at all. And as economic conditions deteriorate, millions of these young people are becoming disillusioned. The following comes from an extraordinary piece that was published by Business Insider: Wages are stagnant or falling. The costs of health care, child care and tuition continue to rise exponentially. Full-time jobs turn into contract positions while benefits are slashed. Middle-class jobs are replaced with low-paying service work. The expectations of American life your parents had when you were born—that a “long boom” will bring about unparalleled prosperity—crumble away. Baby Boomers tell you there is a way out: A college education has always been the key to a good job. But that doesn’t seem to happen anymore. The college graduates you know are drowning in student debt, working for minimum wage or toiling in unpaid internships. Prestigious jobs are increasingly clustered in cities where rent has tripled or quadrupled in a decade’s time. You cannot afford to move, and you cannot afford to stay. Outside these cities, newly abandoned malls join long abandoned factories. You inhabit a landscape of ruin. There is nothing left for you. Years upon years of “training” in our failing system of public education has convinced large numbers of our young people that the solution to our economic ills is to move more toward socialism. Yet history proves that socialism simply does not work. If we continue our steady march down the road toward socialism, we will ultimately end up like all of the other failed socialist experiments throughout history. 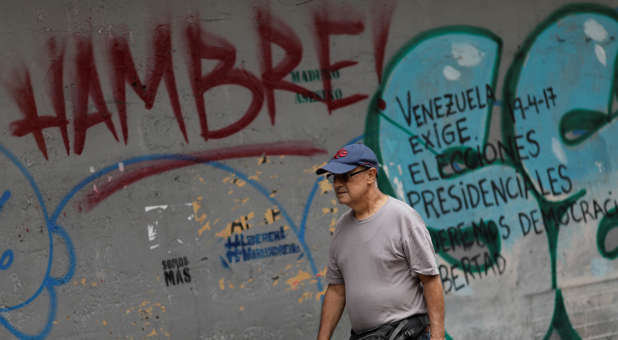 A man walks past a wall with graffiti that reads “hungry”, in Caracas, Venezuela , Aug. 3, 2017. The most recent evidence for the failure of socialism. Let us look at the socialist alternative favoured by Sanders and Warren. The miseries, deprivations and backwardness it has inflicted on populations wherever and whenever it has been tried are boundless. They amount to the biggest empirical data set of political and economic failure in the history of humankind. In Venezuela, to take only the latest unfortunate experiment, it has meant the world’s largest oil reserves being wasted and stolen while children starve on the streets. The historical legacy of Soviet socialism, National Socialism and Maoist Communism, to cite the most egregious versions of this poisonous left-wing political ideology, is so well known that it does not need to be rehearsed here. Even those countries that experienced the more gentle “democratic socialism,” such as modern South Africa and Brazil, socialism has allowed corrupt politicians to pilfer state industries while the poor live and die young in slums. Even in the socialized utopias of Europe, it has meant destructive youth unemployment rates, a dearth of innovation and death panels in hospitals. Our nation is in deep, deep trouble, and it is getting worse with each passing day. I believe God has given America one last chance with Trump. However, unless there is revival in the church which impacts the youth and transforms communities, further judgement as outlined by Jonathan Cahn in The Harbinger will increase in intensity as “birth pangs”.